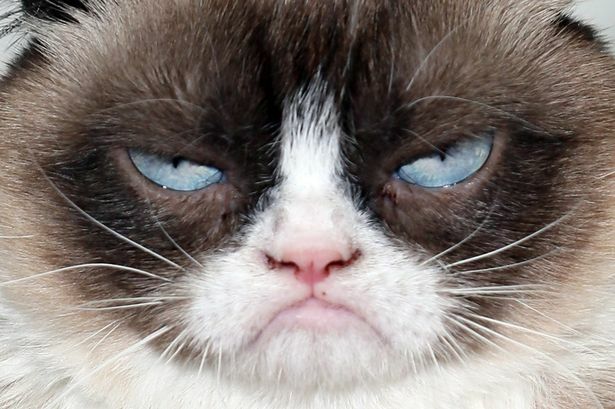 For the record, my colleague Hannah thinks I look like grumpy cat. There are some who agree. Getting my coffee this morning the radio was playing and Sam Cooke came on. Hands up who knows Sam Cooke these days? He was a great, great singer, seemingly rarely heard, so I was pleasantly surprised to hear it. The song was Bring It On Home To Me, one of his best. I walked away with latte in hand feeling swell, humming the tune under my breath and carrying it into the office with me. And it’s Friday. All good. Moved into new home, still settling, and no internet scheduled till 30/6 – long story. Means unless I can provision some temporary network access I can only post here from my phone – which is too much hard work. In the meantime I’m fine, haggling still, in endless dispute and occasionally feeling overwhelmed by it, but surviving. Tears in my eyes earlier watching Shakespeare in Love. It’s not the movie, it’s Shakespeare. I love his stuff. That’s enough to be tearful, but really it’s the genius that moves me so. He’s wonderful, beyond genius. Now I’m watching an old English movie, Blithe Spirit. Classic, written by Noel Coward, directed by David Lean, and starring one of my favourite actors, Rex Harrison. All star. Delightfully witty, and featuring a cameo by one of the great English character actors, Margaret Rutherford. It’s the sort of movie that makes you feel good simply by virtue of being so well done – and pretty funny too.